The Collins House is a rare surviving example of an East Jersey Cottage located in Bloomfield, New Jersey. Notable for its age and architecture, the house also has direct ties to the Morris Canal, which was significant in the state’s transportation and industrial history in the nineteenth century. The Collins House has been determined eligible for the New Jersey and National Registers of Historic Places. John Collins, an Irish immigrant, fought in the American Revolution and was a founding member of the Presbyterian Society of Bloomfield, for which Bloomfield Township would get its name. He married Mary Baldwin of the prominent Baldwin family who owned three of the first mills in Bloomfield. Circa 1790, John constructed a one-and-one-half-story home along the Third River, which is the third main tributary of the Passaic River. The Collins House dates from the earliest period of residential building in New Jersey. The oldest portion of the house still today exhibits the typical East Jersey Cottage form: one-and-one-half stories in height with a gable roof over a three-bay façade and the entrance located in one of the side bays. The house retains intact original rubble nogging typical of 18th century construction. The property also retains its historic well. John Collins’ son, Isaac, is credited with building the larger northern section of the house around 1820. This portion of the house retains Federal Style detailing typical of the period. Isaac Collins was a carpenter who worked on the Morris Canal, which was constructed between 1825 and 1831 and ran across the Collins’ property; Inclined Plane 11 East (which was located where John F. Kennedy Drive runs today) bisected their land. Isaac’s son, also named John Collins, was a carpenter like his father and also worked on the Morris Canal. He became known as a master carpenter and boat builder and had a reputation as an expert bridge builder. He constructed many of the bridges that crossed the canal between Easton, Pennsylvania and Jersey City, New Jersey and was appointed supervisor of the Jersey City division of the canal. Both John and Isaac played an important role in building and maintaining the inclined plane adjacent to their house. The Collins House remained in the Collins family for ninety years until it was sold to the National Paper Manufacturing Company circa 1891. A paper mill was constructed adjacent to the Collins House in 1865 and went through various owners and name changes. The paper mill purchased the house to serve as the mill caretaker’s house, and it remained in this use until the last resident vacated in 2005. By this time, the house was municipally owned, having been acquired by Bloomfield Township in 1982 as part of an arrangement for preservation of the house in tandem with the construction of senior citizens housing on the former paper mill site. The Collins House is historically and architecturally significant as it is one of the earliest houses built in Bloomfield and the only one that survives in its original open space landscape. It is one of the few remaining East Jersey Cottages in the area and is also significant for its association with local transportation and industrial history because of its relationship with the Morris Canal and the adjacent paper mill. The house has been vacant since 2005 and is in poor condition. Later additions, added circa 1900, have partially collapsed, and the main section of the house is open and exposed to the elements. The house has suffered from vandalism, and its cornerstone was recently stolen. 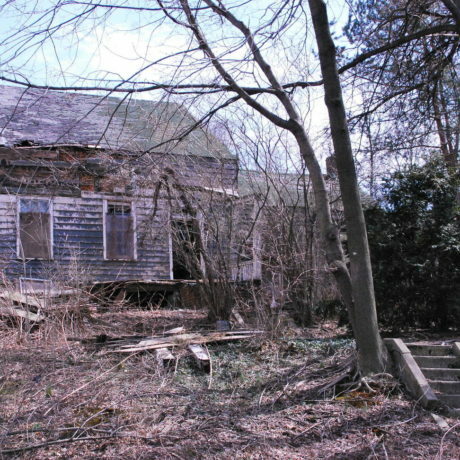 The Township of Bloomfield considers the house too far gone for restoration and has recommended it be demolished. The Friends of the Collins House has formed to protect and raise awareness about the house. They hope to work with the Township to secure the building and elevate the importance of its preservation, with the long-term goals of restoring and possibly acquiring the site. The problems faced by the Collins House typify those faced by many significant historic properties: there is a lack of public awareness about its significance, a lack of support from the municipality, and a lack of funding. While no one openly opposes its preservation, there is only a small group of people actively trying to save it, and help is needed. Preservation New Jersey urges recognition of the significance of the Collins House, and eminent potential in its rehabilitation. Several counties and municipalities have made strong commitments to establishing a Morris Canal Greenway that would preserve extant remnants of the Morris Canal and associated open space and historic resources. The Collins House exemplifies a quintessential cultural element of such a greenway, and if rehabilitated and interpreted, could serve to tell a unique story of early Essex County life and development.